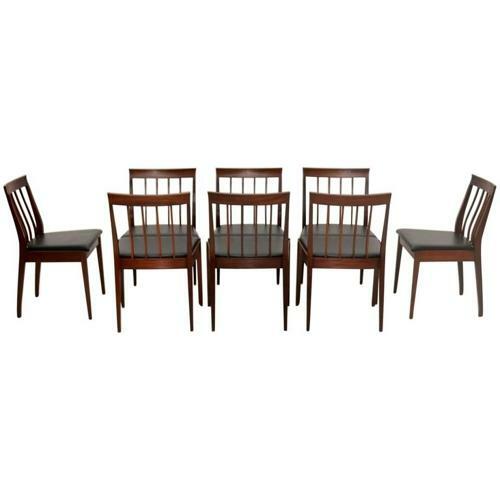 A rare set of eight vintage teak dining chairs designed by Robert Heritage and made by Archie Shine in the 1960s. British industrial and interior designer, Robert Heritage (1927 - ) is celebrated as the most awarded designer in the history of the British Design Council. He is regularly associated with important 20th-century British designers and architects. In 1968, he designed the interior of the Queen Elizabeth II ocean liner. Very good original condition, including the black vinyl drop in the seats.